Takahito Mura, right, and Takahiko Kozura of Japan, left, pose with their medals after the Men Free Skating event during the Four Continents Figure Skating Championships. TAIPEI, Taiwan — Takahito Mura of Japan won the Four Continents gold medal despite placing second to figure skating compatriot Takahiko Kozuka in the free skate on Friday. Mura’s near-flawless performance included a triple axel plus double toe loop jump sequence, and quadruple toe loop jump. 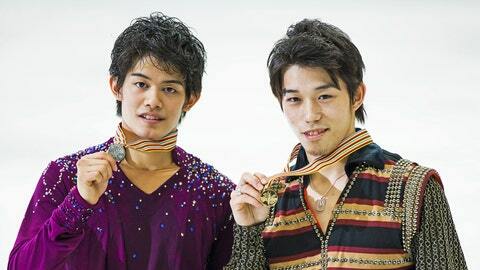 They earned him 158.35 points for the segment and 242.56 overall, more than six points better than second-place Kozuka. "I was able to accomplish what I wasn’t able to accomplish at the nationals and that’s what I want to do in the future for my career," Mura said. "I am very happy to have landed the triple salchow because in practice my success rate was not so high," Sui said.